Weltfeind are a new label, formed by Castellum Stoufenburc’s Soldat D. This label, with three releases at this moment (all of them will be reviewed, evidently), was founded in order to support and promote ‘Depressive Underground Music’. Two projects out of these three perform so-called DSBM (Depressive Suicidal Black Metal), but the label does not want to focus on that specific genre only, which I think is very honourable. Don’t get me wrong; I adore the DSBM-current a lot, as you might know, but this open-minded point of view is both a risk, as well as a gift; a risk, because one can get something else than expected; a gift, because one can experience something else than expected. 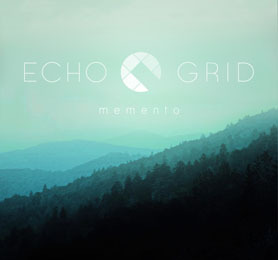 The album was originally released under the former moniker, [Aphelion] (there were some EP’s released under that project name, and Memento was the first full length recording), but now this Dutch project acts under its new name, Echo Grid, with this album as first result since the name-change. In mean time, by the way, Echo Grid did record and release some new stuff too, but that’s another story. Memento is a one-hour soundtrack, considered ‘for losing yourself, finding yourself, remembering what was and dreaming of what may be’. The duality of our being, sonically translated by Echo Grid’s Aural Art, gets firstly expressed, I think, by means of the two-colored lay-out too (green and black interacting in the beauty of their soberness). Yet seen from sonic side too, this material deals with duality. For the better part, this album brings so-called IDM, ‘Intellectual Dance Music’, an experimental (yet much more ‘true’ and ‘honest’ and ‘full’ and ‘personal’) progression out of the (average) Techno-current, being much ‘deeper’ in essence, in spirit, in (by) heart. It’s some sort of softly-electronic and ambiental soundwave-ish experience, at the same time cosmic and, believe it or not (but why shouldn’t you), introspective. Tracks like opener Omnipresent or the somewhat funky epic Mountains include the trippy psychedelics of the Ordo Catharsis Templi-atmospheres, yet translated into a more sober definition. The combination of floating, soft-pulsating beats and eerie, suffocating ear-scapes is pretty breath-taking. The soberness gets pronounced even deeper by the more minimalistic, freezing excerpts, like An Old Friend, Cosmos or When, Where, Why?, compositions which lack of the electro-based energies, in order to focus on even deeper, more obscure and more desolate emotions. The better part is focused on that super-natural equilibrium in between ethereal and esoteric Ambient and minimal / repetitive, loungy and sometimes even tribal Techno.